Ann-Marie is an Ojibway woman from southern Ontario. She is a family support worker, working with Indigenous families in crisis, with a specialty in early years intervention. Her work experiences have given her a wide range of opportunities to grow, learn and meet a variety of people, who have blessed and enriched her life. Ann-Marie is a mother of three children and has five amazing grandchildren. She enjoys creating art of all kinds and enjoy using different mediums, especially natural materials. She also enjoys offering and facilitating workshops on Indigenous culture and crafts and has been doing so for over 10 years. 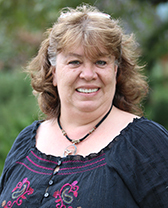 Ann-Marie has taught in many different schools and community organizations.